The VEXO Hand Arm Vibration meter measures the actual vibration from hand-held equipment, while the HAVi devices measure the vibration time and calculate the HSE exposure points. 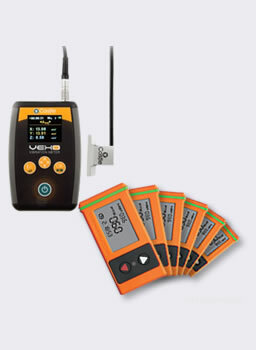 With the VEXO sensor attached to the tool you can measure the true levels of vibration that the worker is exposed to. A HAVi monitor can then be attached to each tool to monitor the actual exposure time, avoiding the fact that workers often overestimate the time that the tool is running. This kit is intended for the measurement of hand-arm vibration levels and to the monitor the amount of vibration that workers are exposed to. The VEXO (GA2006H) is fully compliant with ISO 8041:2005, the standard that specifies the performance and tolerance limits for instruments used in assessing the human response to vibration. It is also the correct grade of meter for making measurements to ISO 5349:2001, the standard for the measurement and evaluation of human exposure to hand-transmitted vibration. The HAVi monitor can measure the total vibration exposure from the vibration magnitude provided by the tool manufacturer, or measured using the VEXO. Set the m/s2 value for the piece of machinery. Attach the HAVi to the tool using the strap or cable ties provided. The monitor senses the tool operating. It starts and stops automatically, accurately recording the length of time it operates and calculating the vibration exposure. The exposure is displayed clearly as HSE points. These can be easily reset when moving between tools or when switching users. Log books are provided in the kit. Display Shows Magnitude/Time/HSE Points at real time on an integrated LCD Screen. Battery Internal, long life. 1000 hours trigger run time. Warning Lights Amber light flashes at EAV (Exposure Action Value) and Red light at ELV (Exposure Limit Value). Programming The HAVi can be programmed easily in seconds without the use of computers or software, making it highly operative friendly. Physical Waterproof and dust proof. Fitting No gluing or sticking required, fits any powered vibratory tool with simple ties or strap, both supplied, a true answer to all requirements.